I wonder, at times, what the difference is between a small business (which I love) and big business (which I loathe), and when that line is crossed. Or if there is a line. My general disdain for corporations seems to be aimed at the negative impact that they often have on the environment, on the local market, and perhaps on the quality of life (measured in vague things like "happiness," as opposed to quasi-tangible dollars), whereas my appreciation for small businesses is that a small business seem to better reflects human grit and ingenuity. But this isn't always the case. There are large businesses that I think provide a fantastic service to the community (life insurance, for example), and there are small businesses that are rotten to their core (shady used car salesmen come to mind). But I think I gravite towards criticism of larger businesses because I feel that they, being powerful, have a greater responsibility to the world around them. Their sphere of influence is greater, and they are ultimately more capable of doing harm, and also more capable of preventing harm caused by the natural running of the business. I think that scrutiny is reasonable. But the reality is that unscrupulous people who run small businesses shouldn't really be treated any differently than those that run large businesses. What we see is that the same punk kid with a slingshot shooting out windows is that same punk adult involved in a hit-and-run scenario. There's just more damage being done because the adult has been given a larger sphere of influence. All that said, my friend Ken Carlson runs a small business. 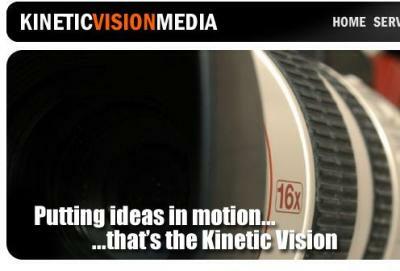 Kinetic Vision Media - a full-service video production company out of Olympia, Washington that's already got several commercials under its belt, some local-artist music videos, and a handful of the bread-and-butter wedding videos that got him started in the first place. Because he's a friend that I've known for many years, I know that his business isn't run by some get-rich-quick chump. He loves this stuff. And perhaps as I imagine his business getting larger... maybe involving travel, or the hiring of more employees, etc., I may have to remind myself that big doesn't equal bad. The same decent kid who's willing to help out a stranger in need may be that same decent adult who devotes some of his time and resources towards important social issues. If you don't have any video production needs, but are interested in what Ken is doing, he's also started a blog. It'll be neat to follow his progress through his thoughts, so if you're interested, give it a read. Love small biz, love big business? What are the standards for a small business? Your friend Ken runs a “small business” which means that it has a small employee count? What if someone has a yacht building company that has 50+ employees but they only sell 1 per year, is that a small business? You say you loath big business, so you mean all big business’ that don't provide something for the community you loath? Take Panasonic for example, the company that manufactured the video recorder that Ken uses (pic on his website) to run his small business, do you loath Panasonic? By the way, I like your rules section that has my IP address recorded, is that new? Well, here's the thing. I was simply explaining that I have a gut negative reaction to big business, and it's probably because of the large messes that large businesses create. When I hear about huge problems (like Bank of America accidentally losing/sharing personal information on 100,000 clients, or like spills from oil companies, or any other such large scale damage), my instinct is to shake my fist at big business and add another item to my list of reasons why I hate them. The amount of damage they do is huge compared to the amount of damage that a small business can do. But I realize that this is my cynicism talking. I stated in my post, I understand that a large business making a large mess is really identical to a small business making a small mess. So on the one hand, I think that large businesses should allocate the resources to take care of the large messes they make, I also understand that some large businesses do a tremendous amount of good. So no, I don't have a neatly organized chart that defines large and small businesses. I think that, in the end, people and organizations are simply responsible for their own spheres of influence. If I am responsible for one person, I should be measured against my care for that one person. If I am responsible for 100 people, I should be measured against my care for those 100 people. Oh, and I added the IP logging for the sake of keeping out the riff-raff. Remember that Matthew guy? He simply wouldn't quit, so I turned on my spam-filter and he was booted for advertising his site (spam) again. And for being a jerk. The IP logging is for added filtering. Every comment logs the IP address now (not visible to the public), so if I see a bunch of garbage from a specific IP, I can block out that IP. Pretty handy. Good stuff. I guess I was just looking for a little more info on why such a hate for the majority of big business. Yea that Matthew guy was nuts, good call on adding the IP thing. To tag back into our other conversation, I guess that adding that feature is a good example of you taking care of your people a.k.a. readers. Just as an oil company would create safety measures to control oil spills you've created a safety feature to keep idiots from posting on your site therefore saving us from reading their garbage. Kudos.